unlike the weighted note generator , it would be amazing to have a weighted rndchorder.. I already got several like that..
though there are often computations for the harmonics instead of per-sine controls. the "guitarTableOsc" can do this too if you set the amount of generated harmonics to a low value. 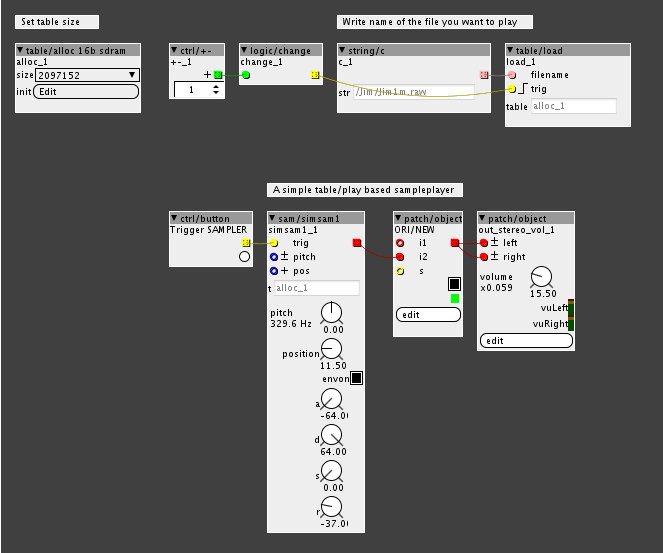 the new version has a save-option for the generated waveforms. Use the guitarAllocation module to save the tab in, this way the table won't be copied for each voice so you can have many voices in your synth. changed the channel-select selector for a channel minimum and maximum (selectLow/High) selector, so you could record split-polyphony. eg. you could record 4-voice polyphonic to channel 1,2,3 and 4 and use the other 4 channels monophonically for drums, bass and melody. ps. for a polyphonic synth with lots of timbres, I'ld advice to use one of the low-CPU wavetable oscillators and using my monophonic table allocator->all voices will read from the same table instead of using their own (though the same table values). pfieuw.... almost screwed up the module.. sorry for that ..but I luckily managed to rewrite a bit, still allowing the new channel-range control AND improve the midi handling. Regarding Markov Chains i found this tutorials for pd (not only) So i guess it is pretty doable in Axoloti. I'm still trying to grasp how to get allpass with ability to modulate delay time. this will get u going for a while my friend..
that should indeed be possible very well. I'm using the inbuild biquad filter, which should save up some memory I think. I just turn bs and bc into arrays (eg. bs and bc to create 5 biquad filters). so you first set the amount of stages with an attribute and then, while live, you set the internal parameters (which can be saved/loaded) for all stages one by one. To reduce space, I only added the controls for a single stage and select the stage with an extra control (controls will be updated to thenew stage-settings when changing stage). 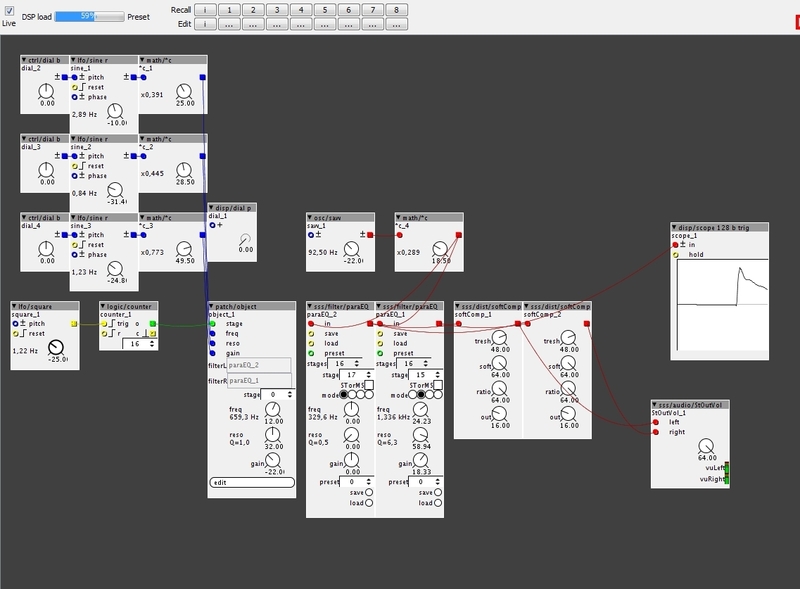 So the module almost looks like a simple biquad filter, but can actually hold lots of filters and "unlimited" presets. At the moment I'm using 8 stages (1x lowshelf, 6x peak and 1x highshelf) in stereo (2 modules of 8 stages, so 16 filters in total) and it's using between 30% and 31%, a bit less then 2% per filter. 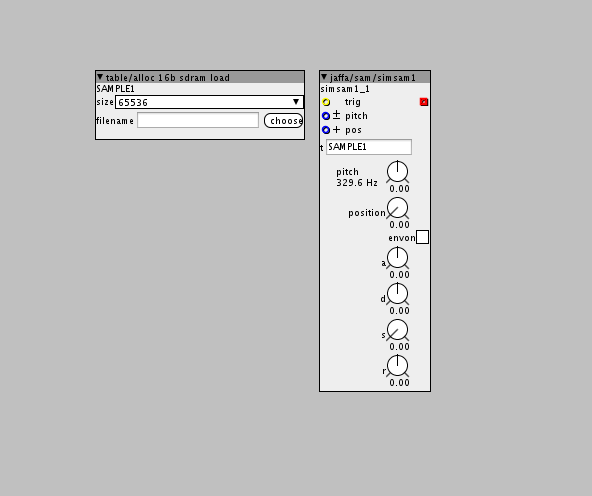 As the module always saves its presets to the same prefix (0:/para"index".tab), you can easily set one of the sides (left/right), save the preset and load it into the filter of the other side. Also added a stereo/mid-side switch that inverses the gain parameter of the module. So when you switch that on either one of the sides (just on one of the two modules), the 2 modules functions in mid-side mode. The SynthiMuse is a new random music composer/re-composer that creates MIDI notes. nice!! but we can do better!!! I build something similar in G2, but I kept running out of memory, because of the huge amount of delay lines. Maybe you have an idea about how to make something more efficient in Axoloti? well, first of all, with such a load of (quite long) delaylines, you're bound to use 16bit array's or even 8bit.. otherwise you just won't be able to generate the needed delaylength. If I'm right, at 16 bit you should be able to create a total of 92 seconds of delaytime. Next to this you will need lots of "readers" for the array to create all the delay-taps. To save cpu, you should use both multiple "writers" as well as "readers", like I did in the "repeater" module. By summing the incoming signal into the array together with the value at that position in the array, you can pre-make a set of delays, which would sound in the normal way if you'ld only use one readout. But by using multiple readouts, the amount of delays will be multiplied with the amount of readouts. So having 5 "writers" and 5 "readers" you'll have 25 taps. Note though, that the first "writer" should "overwrite" the array, while the other should sum to it. but with pitch control (if it has an inlet for it, better). Basically what I want is a simple sample player with pitch control and a string inlet to select the sample. So adding pitch control to the above module will be perfect. Did you try the table/play pitch object? I was aware of this module, but didn't know that was possible to assign the sample that way. for this to work it is important that you give the table/alloc 16b sdram load object a name. And then after given the name, write the exact name into the object reference. In this case "SAMPLE1". But I have a few concerns, as I'm short of recurses, if I turn off the envelope, will it consume extra DSP? Yeah I also prefer that way, its much better, so yeah go with that if you want to change files dynamically. And the table you see in the help patch also has a build in "bleeep" silencer. Without that build in, you will hear an anoyying BLEEEEEP every time you change sound. With this specific table version you get silence instead of bleeep. No there wil be no change when utning on/off the envelope. The envelope uses very very little, DSP, so dont worry too much about that. Also, as the samples have different lenghts, and I will use up to 8 at the same time, what size should I choose for the alloc module? Since you want to load many samples, you should probably only assign the table size needed for each sample. And you need to use a different table for each sample . Dont use bigger tables than you need in general, since you have kind of limited resources.